In Article II, Section 1 of the Constitution of the United States of America, the following requirements are stipulated for those wishing to hold the office of the President of the United States. Source: University of Virginia, Miller Center of Public Affairs, www.millercenter.virginia.edu, March 8, 2006. Born: February 22, 1732, Popes Creek, Virginia. Education: Equivalent of an elementary school education. Children: None, although inherited two children of Martha Dandridge Custis when married: CHILDNAME and CHILDNAME. President: Two terms (eight years) from 1789-1797. Died: December 14, 1799, Mount Vernon, Virginia. Interred: Family vault, Mount Vernon, Virginia. He realized early that the best strategy was to harass the British. He reported to Congress, "we should on all Occasions avoid a general Action, or put anything to the Risqué, unless compelled by a necessity, into which we ought never to be drawn." Ensuing battles saw him fall back slowly, then strike unexpectedly. Finally in 1781 with the aid of French allies--he forced the surrender of Cornwallis at Yorktown. Washington enjoyed less than three years of retirement at Mount Vernon before he died of a throat infection on December 14, 1799. For months the Nation mourned him. Source: www.WhiteHouse.gov, March 9, 2007. Following the ratification of the Constitution of the United States, the Electoral College unanimously elected George Washington to serve as the United States' first President. The former General and Commander in Chief of the Continental Army served two terms as president, holding the office from 1789 to 1797. On June 1, 1789, President George Washington signed the country's first Act of Congress, concerning the administration of oaths. In 1791, President Washington presided over the Nation's first recorded Cabinet meeting, which included Alexander Hamilton as the United States' first Secretary of the Treasury and Thomas Jefferson as the first Secretary of State. President Washington himself laid the cornerstone for the United States Capitol building in Washington, D.C., on September 18, 1793. Washington also laid the groundwork for the United States' earliest foreign policy stance when he issued his Declaration of Neutrality in 1793, a direct response to the emerging conflict between England and France. 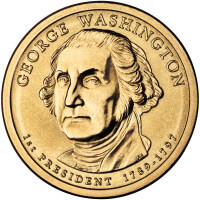 The Coinage Act of April 2, 1792: Commonly referred to as the Mint Act, this Act establishes the United States Mint at Philadelphia, the Nation's capital at the time. The Mint Act called for the production of the following coins, and specified their weight in gold, silver or copper: half-cent, cent, half-dime, dime, quarter-dollar, half-dollar, dollar, quarter-eagle ($2.50), half-eagle ($5.00), and eagle ($10). Act of May 8, 1792: This Act authorizes the Director to purchase up to 150 tons of copper for the coining of cents and half-cents. Act of January 14, 1793: This Act establishes the metal content of cents and half-cents. Act of February 9, 1793: This Act establishes foreign exchange rates, and ends the acceptance of foreign coinage (with the exception of the Spanish milled dollar) as legal tender in the United States. Act of March 3, 1794: This Act provides an accounting method of receiving metals for the purpose of producing coins from the metals received. Act of March 3, 1795: This Act establishes the positions of melter and refiner of the United States Mint and grants the President the authority to reduce the amount of copper used in both the cent and half-cent. 1792: David Rittenhouse, First Director of the United States Mint. 1795: Henry William de Saussure, Second Director of the United States Mint. 1795: Elias Boudinot, Third Director of the United States Mint. Source: www.USMint.gov, March 9, 2007. 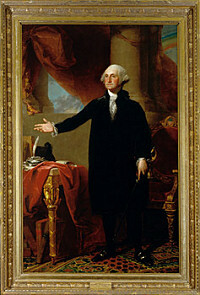 George Washington America's Story from America's Library , the Library of Congress. George Washington (1732 - 1799) American President: An Online Reference Resource from the Miller Center of Public Affairs, University of Virginia. In-depth information reviewed by prominent scholars on each President and administration. Rediscovering George Washington Companion site for Manifold Productions' Rediscovering George Washington discusses three character traits which allowed him to gain and wield power-skill as a warrior, charisma, and political savvy - and three traits which taught him to use it justly and to give it up-devotion to right ideas, civility, and magnanimous renunciation. George Washington George Washington from Wikipedia, the free encyclopedia. George Washington Papers at the Library of Congress The online version of the George Washington Papers at the Library of Congress offers access to the complete collection from the Library's Manuscript Division. This consists of approximately 65,000 items (152, 000 pages). Correspondence, letterbooks, commonplace books, diaries and journals, reports, notes, financial account books, and military papers accumulated by George Washington from 1741 through 1799 are organized into 8 Series. Presidential Inaugurations: George Washington's first inauguration Presidential Inaugurations is presented by the Library of Congress, and other governmental departments, in collaboration with the Avalon Project at the Yale Law School. This presentation includes diaries and letters of presidents and of those who witnessed inaugurations, handwritten drafts of inaugural addresses, broadsides, inaugural tickets and programs, prints, photographs, and sheet music. Presidential Inaugurations: George Washington's second inauguration Presidential Inaugurations is presented by the Library of Congress, and other governmental departments, in collaboration with the Avalon Project at the Yale Law School. The Papers of George Washington from the Alderman Library, University of Virginia. Washington at Valley Forge The story of Valley Forge can be understood only once you have met and recognized George Washington's extraordinary leadership abilities. The Valley Forge Historical Society. George Washington: A National Treasure exhibition is a historic tour from the Smithsonian's National Portrait Gallery, celebrating our nation's first president - the man, the icon, the hero. As Gilbert Stuart's George Washington Lansdowne portrait travels across the country for the first time, Americans of all ages will be able to experience the most important visual document of our nation's founding. This Web site encourages visitors to learn about the enduring legacy of George Washington and gain an understanding of art history through the exploration of interactive portraits. The site also includes educational activities, and a forum for visitors to exchange ideas. George Washington's Mount Vernon Estate and Gardens The estate, gardens and farm of Mount Vernon totaled some 8,000 acres in the 18th century. Today, roughly 500 acres of this historic estate have been preserved 16 miles south of Washington, D.C., on the banks of the Potomac River. Visitors can see 20 structures and 50 acres of gardens as they existed in 1799. The estate also includes a museum, the tombs of George and Martha Washington, Washington's greenhouse, an outdoor exhibit devoted to American agriculture as practiced by Washington, the nation's most important memorial to the accomplishments of 18th-century slaves, and a collection which features numerous decorative and domestic artifacts. His Excellency: George Washington , by Joseph J. Ellis, 352 pages, Faber & Faber Ltd (August 30, 2005). George Washington: Volume 1 , by James Thomas Flexner, 390 pages, Little, Brown and Company (August 1, 2006). George Washington: Volume 2 , by James Thomas Flexner, Little, Brown and Company (1968). George Washington: Volume 3 , by James Thomas Flexner, Little Brown and Company; 1st edition (1970). George Washington: Volume 4 , by James Thomas Flexner, 554 pages, Little, Brown and Company; [1st ed.] edition (November 30, 1972). 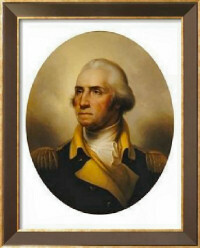 George Washington : Leather-bound editions , by James Thomas Flexner. Washington: The Indispensable Man , by James Thomas Flexner, 448 pages, Back Bay Books; Reissue edition (February 22, 1994). More George Washington Books from Amazon.com. George Washington on DVD from Amazon.com.